To Be An American, Says This Haitian-American, Means You Have A Voice Jan Mapou moved to the U.S. from Haiti nearly 50 years ago. It was important to become a U.S. citizen, he says, because as an immigrant, it makes "you feel that you are in your country." Jan Mapou in his bookstore, Libreri Mapou, in Miami's Little Haiti. Mapou, 74, moved to the U.S. from Haiti in 1969 and became a U.S. citizen in 1974. 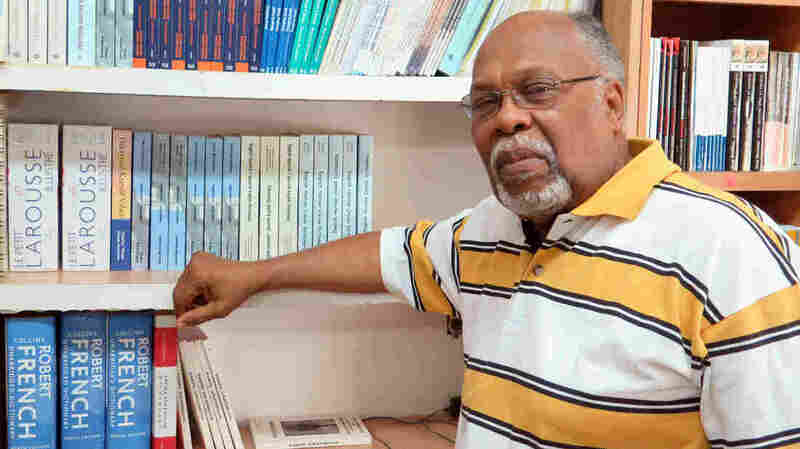 For decades, he has been an advocate in Miami for the Creole language and the Haitian people. Mapou hosts a weekly radio program in Creole on member station WLRN. It's presented by the school district and called Radyo Lekol, in English, "school radio." He plays music and discusses Haitian culture. Mapou doesn't talk much about politics on his show, but he votes in every U.S. election and is a community leader. And he has a lot to say about what it means to be an American. It was important to become a U.S. citizen, he says, because as an immigrant, it makes "you feel that you are in your country." Like all Americans, Mapou says newcomers contribute to their new country and pay taxes. Becoming a citizen, he says, helps give an immigrant a voice in the U.S. "You need to have a voice," he says. Also, he says, there's the American dream. "In order to dream it properly, you have to be an American," he says. For him, being an American "means that you are part of the system and you are there to enjoy your rights — civil rights, all kinds of rights anybody has in this country — and also to participate in the development of the country," he says. "It is an honor to be an American because you've got your rights." Around the world, he says, America stands for democracy and a system where citizens follow the rules and respect others. With globalization he says, the U.S now is closely tied with other nations. Because of that, the president has to be someone who "knows the world," he says. "You have to understand others. You have to understand where we have problems and how to solve them, not creating more problems." His bookstore is a gathering place for people in the community, and it has given him a strong opinion on the qualities needed by the next president. "We have to find a way to live together with other people because America is a land of immigrants coming from all over the world," Mapou says. His prescription for the next U.S president? "You have to understand each culture, each religion, each people in particular and try to cement them together and live together."